Hello there ! Do u love to take RoadTrips with u'r dear ones ? do u love bold bright colors ? do u love bright glitters and flairs then u are in luck, as today i bring to u 4 products by InspiredByDominic Designs aptly named "Travel"
1. 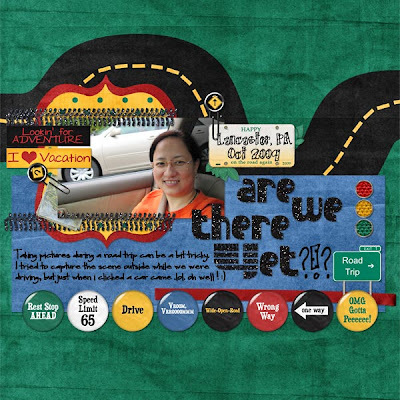 Travel Pack S4H kit - InspiredByDominic Designs : This fun new kit was created to scrap road trip memories ! It's packed full of all kinds of elements and great papers. While it focuses on travel it certainly is not limited to that. Many of the papers and elements could be used in all kinds of layouts from the first bike ride to pictures of your little on one on their power wheels. Travel Pack includes : 6 Solid Papers, 6 Patterned Papers, 2 oil spills, 1 oil spill overlay, 2 Leaf Clusters, 1 Single Leaf, 6 Bumper Stickers, 1 Sheet of Directions, 1 Exit Sign (also a blank exit sign), 1 Set of Glittery Tire Tracks, 1 Grungy Metal Guardrail, 2 Interstate Signs (1 additional blank interstate sign), 1 Blank License plate, Full License Plate Alpha, 1 Distressed Map, 6 Paperclips, 3 Reflectors, 1 Ribbon in 3 colors, 1 Knotted Ribbon in 3 colors, 1 Dashed Eyelet Ribbon in 2 colors, 1 Fun Ahead Sign (also a blank yellow sign), 1 Stop Sign (and blank), 1 Route 66 Sign (and blank), 3 Tags. This product is allowed for Scrap4Hire projects. my review : love the colors in this kit. The elements are wonderful and the alpha which comes with the kit is awesome. You can make u'r own numberplate for u'r pages using it. 2. 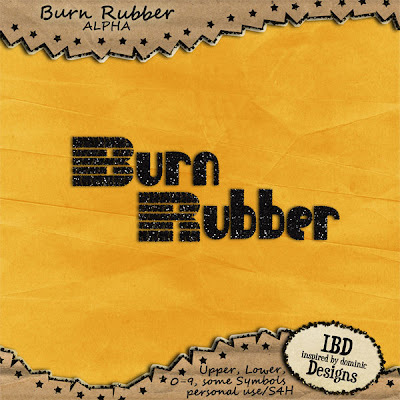 Burn Rubber Alpha - InspiredByDominic Designs : This gritty and sparkly new alpha is perfect for any travel, racing, vacation, or boy layouts that you may create. The glittery letters will add a special spark to your pages. This alpha was created to match the full Travel Pack set and includes uppercase, lowercase, numbers, and some symbols. This alpha is allowed for use in Scrap4Hire projects. my review : Black sparkle is beautiful - i love it. very versatile and I think it can be used with any kit. 3. Travel Pack Flairs - InspiredByDominic Designs : This huge flair set includes 25 flairs that coordinate perfectly with my kit, Travel Pack. 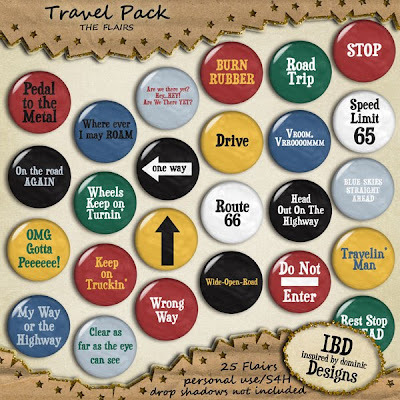 They are just what you need to add a little bit of fun or a touch of silliness to your travel layouts. A few of the phrases include: OMG Gotta Peeee!, Do Not Enter, Travelin' Man, Head Out On The Highway,Keep On Truckin', My Way Or The Highway. This product is allowed to be used in your scrap4hire projects. my review : fun, hilarious and really helps tell a story in u'r pages. u will love it, i am sure. 4. 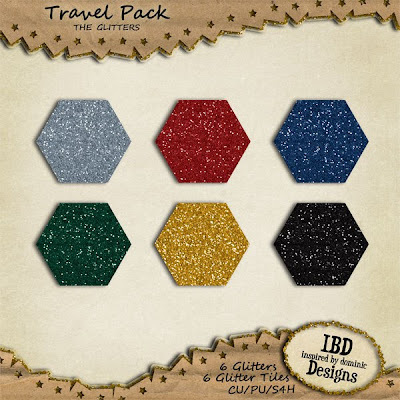 Travel Pack CU Glitters - InspiredByDominic Designs : If you love Travel Pack and want to add some sparkle to your layouts these glitters are perfect for you ! This glitter set includes 6 different glitter styles in one asl set and 6 seamless 3x3 300ppi glitter tiles for those that do not use photoshop. These glitters are allowed for COMMERCIAL, PERSONAL, and S4H projects. my review : this is my fav glitter set i have. love the bright colors. they have a lot of sparkle but its not overwhelming. its just right. Click on the preview to BUY :). 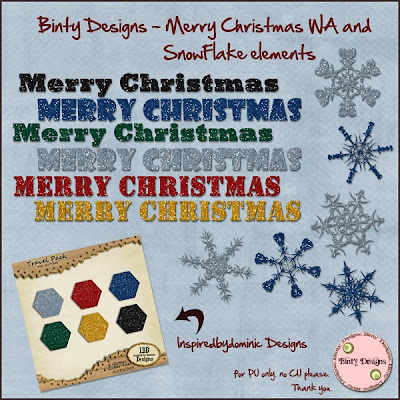 And a snowflakes and Christmas Words freebie for you using the Travel Pack CU Glitters. Enjoy! Thank-you for looking and have a nice day !